I am going to try and post some ideas for quick, easy and cheap meals to share with your baby and/or toddler at lunchtime in a series (if I manage to come up with enough ideas) called “What’s for lunch”. Evidence shows us that children are influenced by what their parents eat and drink, this makes sense (science often tells us what we already know). So it follows that parents can have a positive or negative effect on what they’re children eat depending on their own diet. Eating together also helps babies to learn that mealtimes are social times. This recipe uses breadcrumbs – don’t to throw unused loaves away, instead cut off the crusts and put them into the food processor to make breadcrumbs which you can freeze for ages. 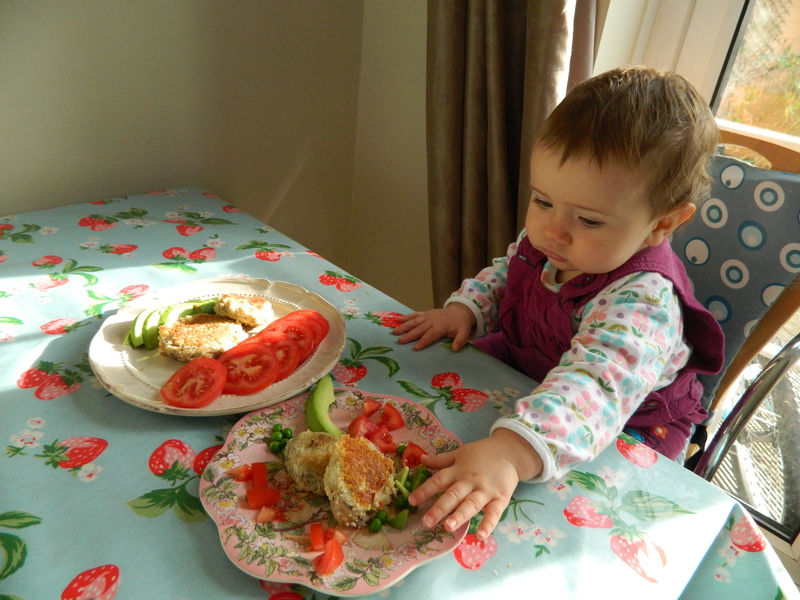 I think fishcakes are easier for babies to handle and eat about 10 months (depending on baby’s food handling skills it may be slightly earlier than this). This recipe uses leftover mashed potato and includes tinned sardines which are a great source of omega 3’s, protein, iron, zinc calcium and vitamin D . Also, as they are lower down the food chain, compared to tuna and marlin, they have lower levels of mercury compared to those bigger fish. An interesting thing happens to mashed potato when it’s left to cool. Its starch structure changes in a way that lowers its GI so that energy is released more slowly into the bloodstream. Potatoes usually have a high GI (as much as 88) and research shows that it can be lowered a GI of 56 if it is allowed to cool. Drain the sardines and mash them well with a fork – no need to remove the bones as they are small and soft. Mix the sardines with the potatoes and chopped parsley if you are using it. Form into 4 small cakes for babies (I made two – see photo – which were a little too big). Once you’ve got the shape and size you want dip the cakes in flour, then egg and then breadcrumbs. Fry the cakes for about 5 minutes on each side until golden brown. The portion sizes I use are from the CHEW! guidance which is based on recommended intakes for energy and nutrients. They are meant as a guide so don’t worry if you’re baby doesn’t eat all their food that they won’t get enough nutrients. And for you – there should be about 60g of sardines so mix with about 100g of potatoes and serve with two 80g portions of vegetables. For younger babies (7-8 months) I would recommend using the ingredients (without making the fishcakes for baby), pureeing, mixing with baby’s usual milk and serving with the vegetables as finger food. 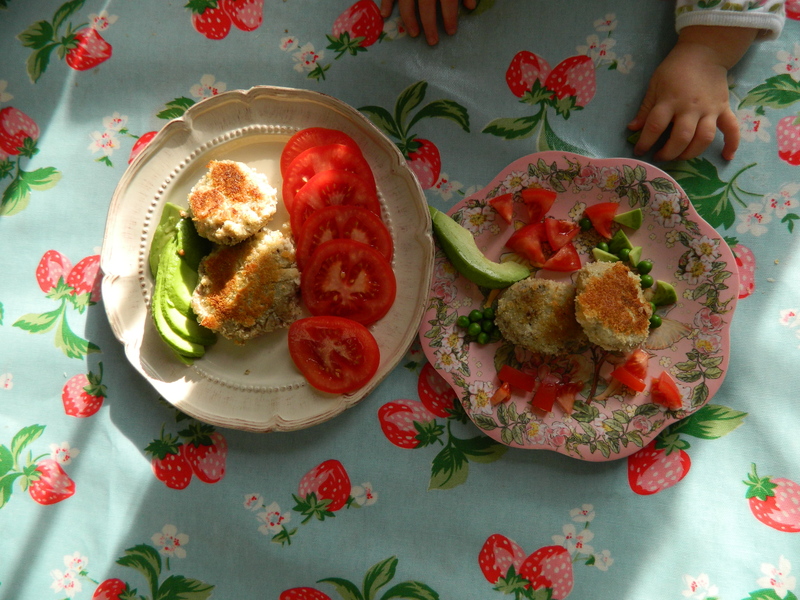 If your baby is able to eat their meal as whole food well – for my baby this is around 10 months – but your’s may be able to do this younger, then make the fish cakes rather than puree. Based on my experience, younger babies are not able to feed themselves well enough in this way, so are not able to get enough protein, iron, to meet their dietary needs. Portion sizes for this age group are 30g sardines to 50g potato and 20g vegetables. If your baby has a gluten intolerance or allergy, dust in gluten free flour and use breadcrumbs from gluten free bread. You can try just dusting in flour too however the fishcakes don’t hold together so well and can be a bit too squidgy. Make extra of these and you can take them with you for days out – in a lunchbox – remember to keep them chilled though. I have tried freezing fishcakes before, but have found it doesn’t work well. *Someone asked me whether they could use sardines in tomato sauce. And I dont see why not for adults but, having looked at the ingredients list, the sardines I have seen in tomato sauce have salt added, so aren’t a good option for babies, or really children, ideally. **Ideally the fishcakes can be baked at 200°c/ 400°f/gas mark 6 on an oiled baking try for 10 minutes (turning once) – baking is healthier than frying but I didn’t have time to wait for the oven to heat up.